Much of what we think we see is not real – it’s an illusion. A favourite pastime for many visual psychologists and artists is to baffle and confuse our perception by making things appear that are not really there, or manipulating the way that we might see patterns or colours. The origin of many illusions lies in the fact that the brain often receives incomplete or conflicting information from the visual system and has to ‘fill in’ or rectify the missing information. Most of the time it gets it right, but sometimes, especially with artificially constructed scenes, it can be misled. We know that a vast range of illusions trick human perception, but what about other animals? Researchers are now beginning to shed light on whether non-human animals see visual illusions, and whether they might even use them in nature to deceive and exploit others. The first reason why animals may utilise illusions is for defence against predators. Back in the 1970s a series of studies on snakes suggested that particular stripes and zig-zag markings created the impression that a snake was either moving at a different speed, or even in the opposite direction to reality. Something about the banding patterns and colours seemed to fool observers into misjudging speed. It is perhaps not surprising then that a now famous visual illusion by Kitaoka Akiyoshi, the ‘rotating snakes illusion’, is broadly based on the idea of contrasting bands of colour. These create the very strong impression of movement where none truly exists. 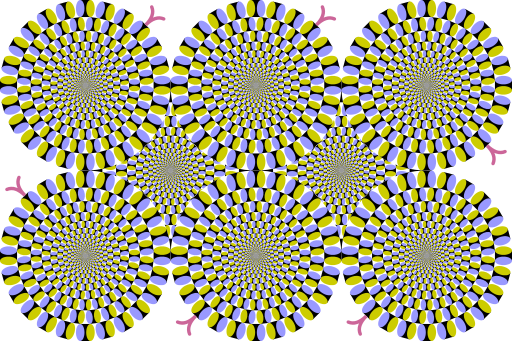 ‘Rotating Snakes peripheral drift illusion, based on design by Kitaoka Akiyoshi’, by Cmglee. CC BY-SA 3.0 via Wikimedia Commons. This illusion has recently been shown to work on other animals too. A recent study trained fish to discriminate between motionless or moving stimuli. When they were then shown an image of the rotating snakes illusion the fish categorised the stimulus as moving. Rather more observational video evidence shows that kittens are also fooled by this illusion. So what might all this mean for animals in the wild? Many species of snake, fish, some insects, and of course zebra have prominent stripes and banding patterns. Perhaps these help them to avoid being captured by predators? A few years ago, along with several colleagues including Graeme Ruxton at the University of St Andrew’s, I tested whether humans’ ability to capture moving objects would be affected by the patterns that the targets had. We gave subjects the chance to play a computer touch screen game, whereby they tried to capture erratically moving rectangular ‘prey’ against a range of visual backgrounds. The findings were not completely clear-cut, but we consistently found that striped and zig-zaged targets were caught less and missed more than objects with other patterns, like spots and blotches. Most recently, Martin How from Bristol University and Johannes Zanker from Royal Holloway University made a computer model based on how animal vision might encode motion. They then ran through the model shifting images of zebra and unpatterned horses, and found that the model responded with much higher levels of erroneous motion when presented with the zebra. These and other strands of evidence suggest that striped patterns in nature may at least sometimes confuse and ‘dazzle’ predators into misjudging speed and direction, allowing the prey to escape, in much the same way as some dazzle painted warships in WWI. A male great bowerbird (Ptilinorhynchus nuchalis) standing in front of his bower. 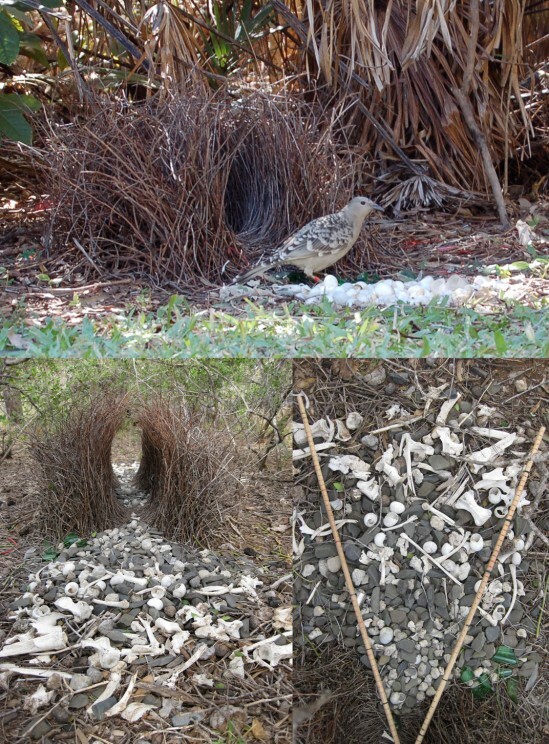 Bottom: the grey and white decorations of the bowerbird, arranged according to a size gradient, with small objects closer to the bower structure. Photograph by Laura Kelley. Do not use without permission. Obtaining protection is just one possible use of illusions. Another is to manipulate potential mating partners. The colour patterns of many animals play an important role in mate choice, often with females choosing to mate with brighter or more gaudy individuals. However, perception of colour is affected by many factors, including light conditions and even the colour of any adjacent colours, among other things (remember the debate over ‘The Dress’ last year?). As we might expect, some animals use this phenomenon to their own advantage. Recently, a study on guppy fish (the brightly coloured tropical species often kept as a pet) showed that males preferred to associate with rival males that a female would not be strongly attracted to. In doing so, he may make his own appearance look better (more colourful), and improve his own mating chances. Males also manipulate female perception of size and distance. Work in the last few years at Deakin University by Laura Kelley and John Endler has shown that bowerbirds can manipulate female choices through creating illusions. Bowerbirds, found in New Guinea and Australia are famous for males building elaborate bower structures often decorated with gaudy objects. Females inspect the male’s bower and decide whether to mate with him or not. In the great bowerbird (Ptilinorhynchus nuchalis) males build a tall bower of sticks with an ‘avenue’ running through it. Females stand at one end and watch as a male waves colourful objects at her from the other end. He does this against a backdrop of plain grey objects (stones, bones, and other things; which presumably enhances the colour of his displays). Overall, illusions come in many forms work in a range of complex ways. At present, only a handful of studies have started to ask whether they exist in nature and why. 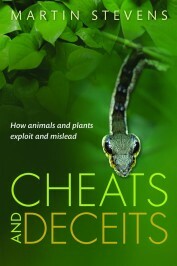 We are only just scratching the surface of a method by which animals may exploit, trick, and manipulate others. Featured image credit: Zebra pattern, by Martin Stevens. Do not use this image without permission.